Today, we took another important step in bringing the Obama Presidential Center to life. Through an innovative process driven by our commitment to creating opportunities for diverse and local businesses, we selected Lakeside Alliance — a collective of five construction firms — to manage the construction of the center. Read the full press release below. Lakeside Alliance is made up of Turner Construction Company, one of the biggest construction managers in the country, and four small Chicago-area firms: Powers & Sons Construction, UJAMAA Construction, Brown & Momen, and Safeway Construction, which are some of the most established and well-respected African-American owned firms in the city. Members of the Lakeside Alliance — a collective of five construction firms selected to manage the construction of the Obama Presidential Center. Together, they will play an integral role in making sure diverse individuals and local businesses in the community have a seat at the table in the development and construction of the Obama Presidential Center. Chicago, IL – Today, the Obama Foundation announced that it has selected Lakeside Alliance to serve as the construction manager for the Obama Presidential Center. Lakeside Alliance is a newly created joint venture consisting of Turner Construction Company, and the Presidential Partners consortium of Powers & Sons Construction, UJAMAA Construction, Brown & Momen, and Safeway Construction. Powers & Sons, UJAMAA, Brown & Momen and Safeway represent some of the most established and well-respected African-American owned construction firms in Chicago. The creation of the joint venture will ensure that minority firms from the South Side will be in significant leadership positions in the construction of the Obama Presidential Center. The Presidential Partners will have a major stake in the financial risk and reward, day-to-day decision making and strategy-setting for the project, and people of color and women will be performing meaningful roles on the CM team. Smaller firms are often precluded from winning large-scale construction projects because they lack the necessary resources or experience with similarly-sized projects; the joint venture structure is designed to solve for that problem by creating a consortium that includes minority firms working in partnership with a national firm. This structure goes beyond a typical arrangement where a national firm receives the majority of a contract and an MBE/WBE receives a smaller share. The Obama Foundation anticipates that participation by the minority firms will provide the experience they need to grow and compete for other significant projects in the future. Some of the major projects that members of Lakeside Alliance have completed include the Modern Wing and Nichols Bridgeway at the Art Institute of Chicago, the University of Chicago Reva & David Logan Center for the Arts, and the University of Chicago Booth School of Business Charles M. Harper Center. Members of Lakeside Alliance have also completed multiple other projects at the University of Chicago and with such institutions as the University of Illinois at Chicago, City Colleges of Chicago, the Illinois Institute of Technology and Purdue University. In addition, members of Lakeside Alliance provided more than $600,000 in philanthropic giving to causes in Chicago in 2016, including community development, education, and others. 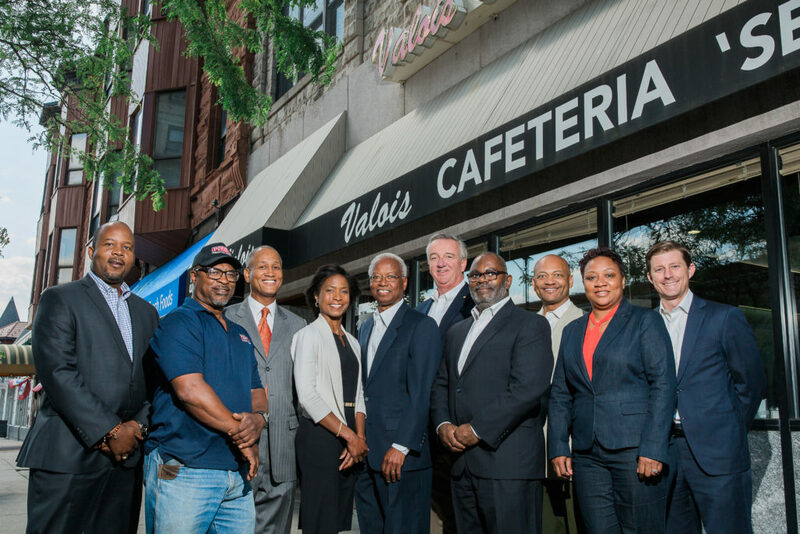 The members of Lakeside Alliance have demonstrated a deep, longstanding commitment to increasing diversity and inclusion in the Chicago construction industry. For the Obama Presidential Center, they are committed to exceeding industry standards and surpassing their own milestones by awarding as much as half of the expected $300 million + of subcontracts on the project to diverse suppliers, and to ensuring that a significant percentage of the total project work hours are performed by minorities and residents from the project’s neighboring communities. The contract Lakeside Alliance signed with the Obama Foundation includes financial incentives for exceeding these ambitious goals and penalties for falling short of the goals set. One of the nation’s largest construction managers, Turner Construction Company has been working in and around Chicago since 1924. The firm employs 215 people in Illinois and manages approximately $500M worth of local construction activity annually. Turner is consistently recognized as the leading “green” builder in the United States. Powers & Sons Construction Company just celebrated its 50th year in business and has grown over that time to become one of the most-recognized African-American owned general contracting, construction management and design-builders in the region. The firm has more than 70 professionals and fully-staffed offices on the South Side of Chicago, as well as in Gary, IN and Indianapolis, IN. In 2016, the company managed more than $200 million in construction projects. Founded in 2002 by owner and architect Jimmy Akintonde and based on the South Side down the street from the future site of the Obama Presidential Center, Ujamaa Construction Inc. (UJAMAA) has consistently built its portfolio with successful projects and satisfied clients. Under Akintonde’s leadership, the UJAMAA team is equipped with decades of combined general construction experience from the most premier construction companies in the Midwest. In 2016, UJAMAA completed over $42 million in local construction projects. Brown & Momen, Inc. is a professional, South Side-based corporation established in 1988 providing comprehensive services in general contracting, construction management, owner’s representation, and carpentry. Brown & Momen has worked on several notable Chicago-based projects, including museums, apartment complexes and schools. Safeway Construction Company, Inc. has provided quality and affordable construction services for over 30 years. Based on the West Side of Chicago, their team offers a unique combination of Chicago construction experience, minority & women outreach, relevant project experience, along with well-established construction best practices.